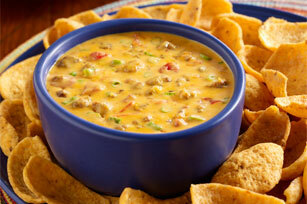 Queso recipe made special by adding flavorful chorizo to Ro*Tel zesty tomatoes and Velveeta dip. Heat large nonstick skillet over medium-high heat; add chorizo. Cook 5 minutes or until finely crumbled and browned, stirring occasionally. Drain; return to skillet.